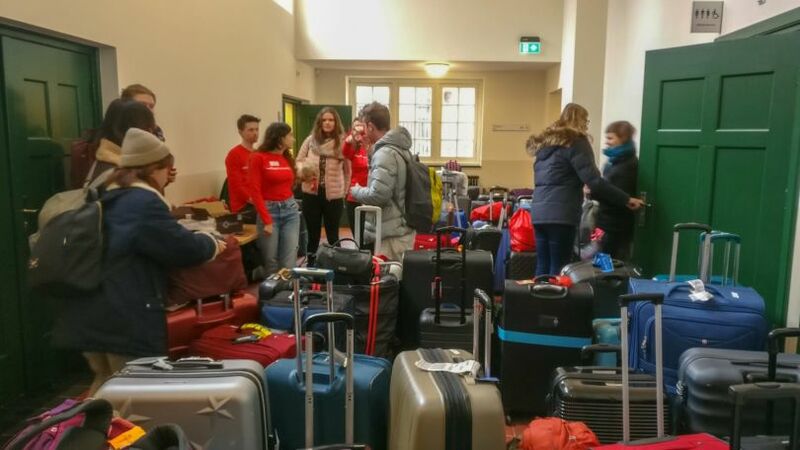 Americans dominate the group of international students who arrive at Radboud University today. This week they’ll have a winter-time orientation. An orientation week in January? Absolutely: this week Radboud University is welcoming a new group of international students. Most of them are exchange students, and a few are new Master’s students. A total of 226 students will participate in the orientation week. So this week you can again expect to encounter students in red Radboud hoodies wandering across campus. And they can certainly use those red sweatshirts in this bitterly cold winter weather. There’s even a big chance that some of these international students will see snow for the first time (snow has been forecast for Wednesday). The largest group of participants in the introduction week consists of Americans (26), followed by 21 Italians and 11 Turks, Spaniards, Greeks and Canadians. According to Eelco van Noort at the International Office, the fact that there are so many Americans is the result of active recruitment and new collaborative initiatives with universities in the US. It is worth noting that the new international students will further contribute to feminising the student population in Nijmegen: 71 percent of the participants are women. Most of the students will arrive at Schiphol today. In contrast to August, the students won’t be met at the airport by Radboud staff. “The group is too small for that,” says Van Noort. But the students’ lives will be made easier in all sorts of other ways. Not all students starting at Radboud University this semester, participate in the Orientation Week. The university expects an influx of 320 students in total. Those who were not capable of coming to Nijmegen this week, will be able to follow a shorter version of orientation later on. To make life easier for them, for example, transportation will be arranged to the nearest IKEA shop next week. And they’ll be offered a course in how to ride a bicycle – an intricate part of student life in the Netherlands. Students who take part in the bicycle course at the Sports Centre this Thursday will find themselves in the spotlight. Journalists from both local and national media have arranged with Van Noort to be there for the first metres cycled by international students on Dutch soil.